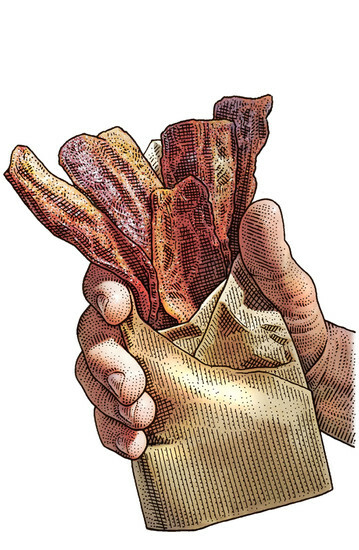 A bacon bouquet. Picture from The Wall Street Journal. Of course they have chocolate covered bacon for dessert. Grilled Cheese. From Bacon Bacon’s menu. Bread spread with bacon jam then add bacon, shredded cheese and grill. suppression, you can still have bacon jam on your bacon grilled cheese. Oh that sounds so good! Check out their Facebook page and go drool over their menu at the truck. I know what ingredient will be involved in supper at our house tonight. Yikes! I guess I’m a hater! I’m Muslim so we grew up not eating it. It’s definitely not one of my favorite smells, but the worst place for it is next to medical office! My office is right above the cafe downstairs and my patients can smell it the first half of the morning!! Actually it is one of the few times I eat meat, to be honest. Your patients must leave hungry! I used to work next to a Burger King and even if I would rarely eat anything from there, and knew it didn’t taste good, it smelled so good we were all always hungry. I was a vegetarian, though I’m now a pescatarian, so it’s a long while since I’ve eaten bacon. I have to admit that the smell of bacon cooking definitely makes my mouth water! I’m pleased to hear that Bacon Bacon is now re-opening, even though I won’t be going there! I LOVE bacon! I find it hard to believe that some people don’t like it. Bacon + Chocolate = Heaven! Ever have bacon-covered chocolate? Wonderful!